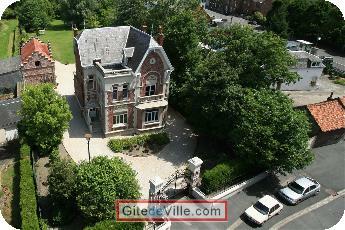 Vacation Rentals - Holiday Rental ads in the city of Cambrai in France for Tourism. Bed and Breakfast of 80 m² in Cambrai for 10 peoples. Petits déjeuners inclus. Pas de supplément pour l'espace piscine ouverte de mi-mars à mi-octobre. One bedroom is located upstairs of the main building and two others on the floor of the annex building. The total area of the property is 6000 sqm. Natural environment with its landscaped gardens. Serene atmosphere with indoor heated pool and massage reservation proposal. Animals accepted with conditions. The property is located just minutes from downtown, train station and major highways, in a quiet area. Cambrai is 25 km from Valenciennes, Arras 37 km and 60 km from Lille. Last Ads update : 04/04/2012. Owner of an urban accomodation or B&B to rent in Cambrai ?